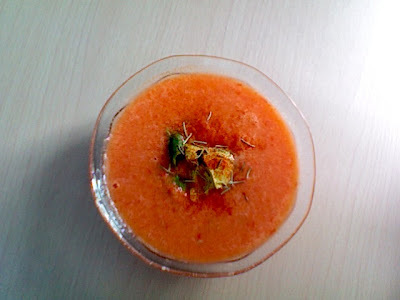 Here we have a gazpacho recipe, which is more or less really tasty tomato soup. I fudged the recipe a little, added stuff, and didn't put in things that I did not have. Sprinkle with avocado, celery, and chopped pepper to taste. Serves 6. I pretty much halved everything in the recipe. I also added some cayenne pepper and rosemary on top, and only added avocado pieces on top. The consistency is really smooth and watery, which is a nice change. I'm not sure it's supposed to be this thin, but it's fantastic. I'm going to drink it right from the bowl because using a spoon would take, well, months.